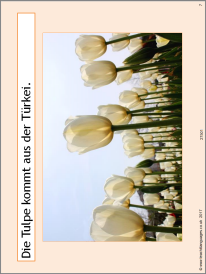 Over 30 more slides of bizarre but true facts in German. This PowerPoint makes a brilliant lesson starter to dip into regularly for authentic reading practice guaranteed to keep students motivated. There are two more PowerPoints in this series: Unnützes Wissen 1 and Unnützes Wissen 2.